Over the weekend of 2/3 May the Russell McVeagh Auckland Regional Schools’ Debating Championships were held at St Kentigern College, Pakuranga. Despite the rainy weather a strong contingent of twenty teams entered the competition and turned up ready to debate early on Saturday morning. The first round started amongst much excitement as the teams debated the merits of gender quotas for the police force, followed by a second around about abolishing copyright on music. This year Auckland was lucky to have a special guest, Julia Fetherston, present a coaching and adjudication workshop. Her interactive presentation was of great benefit to all coaches and students who attended and left many students enthused about putting Julia’s advice into practice for the final round of the day. Round three was a make or break round for many teams who were challenged by the moot on whether private mercenaries should be used to defend against pirates. After a tightly fought break, with ten teams in contention for eight spots, the competition proceeded to quarter-finals on Sunday morning. Teams in the quarters battled over whether vaccinations should be compulsory for children. Four teams emerged as semi-finalists: Kristin School, Auckland Grammar, Westlake Boys’ and St Kentigern College. These teams then battled over whether insulting religion should be a crime in the semi-finals. After five rounds the two finalists were revealed to be Auckland Grammar and St Kentigern College. The final was a close and interesting debate to watch on the motion “This House would tie the provision of aid to women’s rights”. In a repetition of the 2007 final, St Kentigern College came away with a win on a 2-1 split decision, putting their name to the Claire Ryan Cup for the second time in three years. The best speaker of the tournament was Joshua Baxter, who was the inaugural winner of the Convenor’s Cup. A number of other awards were given out. Two reserves to the Auckland squad were named: Amy Pollock (Diocesan School) and Ahalya Sethiyaselvan (Epsom Girls’ Grammar School). There were also two highly commended speakers who put in great performances over the weekend: So Yeon Kim (Westlake Girls’ High School), and Cassandra Hidajat (St Cuthbert’s College). 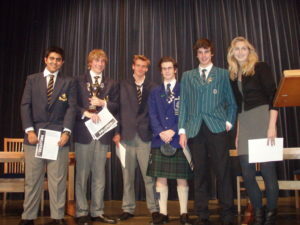 The Most Promising speaker of the tournament was Conrad Grimshaw (Auckland Grammar). An Auckland Development squad was also selected, comprising promising Year 12 debaters. The squad is: Conrad Grimshaw (Auckland Grammar), Joshua Harvey (Mt Albert Grammar School), Amman Bulchandani (Auckland Grammar), and Jeffrey Mei (Westlake Boys’ High School). 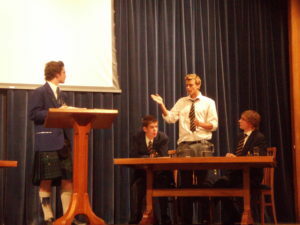 These debaters will be invited to train with the Auckland squad. Thanks to Chris Hodder and the team at St Kent’s who put on a great weekend. Also, thanks to the adjudicators who gave up their weekend to help out: Christopher Bishop, Claire Ryan, Julia Fetherston, Jordan Ward, Kathy Errington, Akif Malik, Glenn Riddell, George Minton, Heather Macbeth, Mitchell Cooper, Stephanie Thomspon, Neeharika Chowdhary, Ben Milson, Mark Tushingham, and Brad Ward.